The anechoic chamber is a specific test environment for radio frequency signals (RF) and microwaves (MW), used to make measurements of electromagnetic fields without letting in any interference from outside. Its size varies according to the field of application and the frequencies used. The anechoic chamber is used to perform measurements in order to study acoustics and electromagnetic fields. -For the low frequencies (usually up to 1 GHz) ferrite panels that convert the energy of the incident wave into thermal energy. The shape of the absorbent material and its inner layout are the result of a careful study of the propagation inside the chamber because the shape, together with the properties of the material, helps determine the chamber’s capacity to attenuate the incident waves. The anechoic chamber has also an external shield created through a Faraday cage, that prevents the external propagation of fields that were generated internally and viceversa. To make sure that the chamber is working properly, it is periodically necessary to test its electromagnetic shielding and its "quiet zone". -Measurements of emission and susceptibility in the EMC-EMI fields. In this specific case, the room must be a semi-anechoic chamber (it means that only the floor is reflective, with no lining). 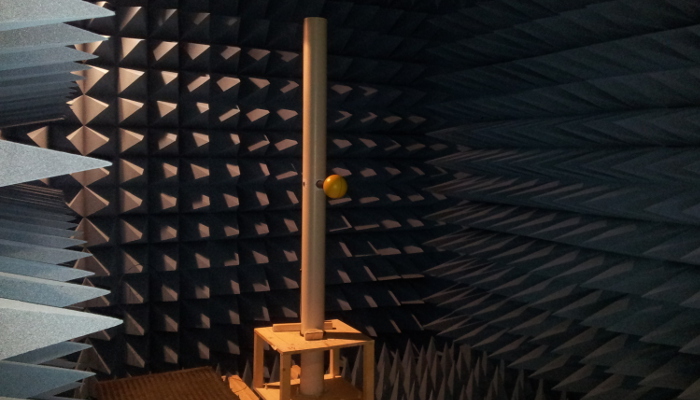 MPB's anechoic chamber is designed for testing and R & D activities up to 40 GHz. The laboratories, equipped with the latest technological equipment, are located in the Polo Tecnologico Tiburtino in Rome. The professionalism and expertise of the qualified staff at MPB are the strengths of this company.